There’s still time to choose and send Holiday flowers this year. While it’s easy nowadays to find the perfect florist (online or otherwise) to make your holiday bouquets and deliver your seasonal sprigs, it’s not always simple to plan for flowers. What will your giftee like? Which flowers are in season? Will your message be perfectly conveyed with your choice? These questions find answers with consideration of the wide range of flowers available to give this season. Poinsettias have a longstanding tradition as Christmas flowers. They’re mostly seen in red, but they come in shades of white, cream, peach and pink too – and marbled. Poinsettias offer a splash of color outside and inside of a home. They’re beautiful on a hearth or countertop, and they can be easily planted in a garden for enjoyment in seasons to come. Keep in mind that poinsettias are toxic to pets, so if your giftee has animals, point out that these flowers should be kept out of reach. 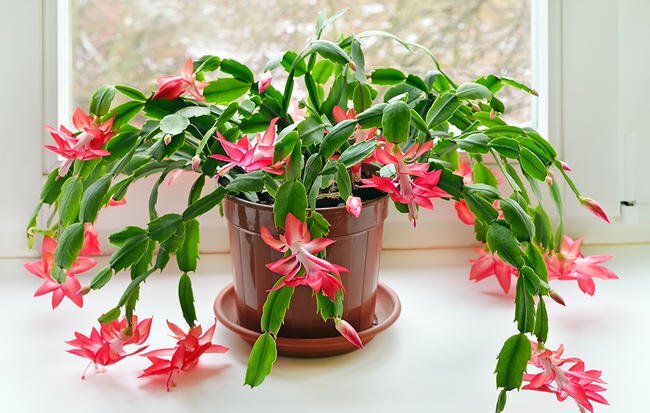 The Christmas Cactus is a flowering plant that offers the perfect festive addition to a desert home and it can be a beautiful addition to houses in moderate climates. This plant blooms with pretty flowers in winter, from November until February. It’s often called simply Christmas Flower and it’s a unique seasonal blossom to give. There’s nothing like a Christmas wreath to say “Merry Christmas.” Your gift recipient will feel your warmth upon receiving such a merry present, and hopefully the feeling will transfer to any visitors to your giftee’s home. Christmas wreaths are synonymous with holiday cheer and good tidings. While they’re usually placed on the front door of a home, we’ve seen some stunning wreathes hung over dramatic archways and fireplaces in houses. They’re versatile and beautiful! Candy-striped amaryllis offers dazzling swirls of red and white for a holiday home. You can find these fun Christmas flowers in a few different patterns including a red flower with white edging and a white-petaled flower brushed in red. We love a bunch of candy-striped amaryllis tied together with a pretty white ribbon and placed in a tall vase. A cluster of paperwhites looks like a seasonal snow flurry and is absolutely magical! Paperwhites are stunning when floated in a silver bowl or when placed in a shallow glass dish. They’re enchanting flowers for an elegant holiday house and for nearly any setting. Consider wrapping paperwhites in fabric or in plain brown paper. Which holiday flowers are your favorites? What blossoms would you like to surprise someone with this year?